Springtime in Copenhagen. On the cusp of flowery dresses and a sea of bare legs. What is it about red bicycles? Wouldn't ride one myself, but my goodness they are fine. Two more sure signs of spring in Copenhagen. 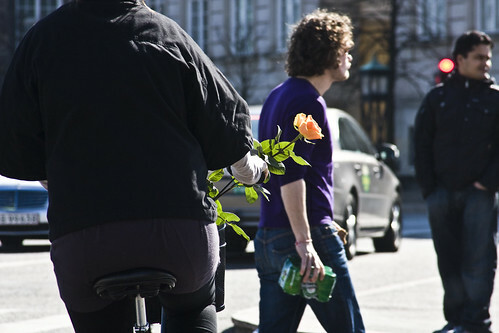 A fresh flower in a bicycle basket and a six pack of beer in the hand of a man heading down to his mates on the canal. I have the same comment for the beer and the young woman's stockinged legs: GULP!! Also on the cusp of a completely flat rear tire! However, the photo and subject are simply beautiful. Thanks (as always) for sharing. I love the red cyclist too. But, as I take a bite out of the apple of knowledge, uh, her saddle is a little low. Your knee is supposed to be just about straight on the downstroke. And the rear tyre needs more air. Just fixing these minor details makes a big difference. Finally, a brisk pedalling rate on a low gear is great for getting up hills. It's almost like adding electric assist. I think I know why everyone looks beautiful in these photos. All the less than average looking people must be hiding in the cars. @Martin - you and me both :-) There was a bike in that picture? Red, you say? I know this is the cycle chic blog, but that rear tire is soooo flat. That's like a +10kph head wind all the time.